President Muhammadu Buhari says Nigeria is now respected internationally and that the international community is very supportive of efforts to put the country in order. Mr. Buhari also observed that his interaction with foreign heads of state and government has been very encouraging. The President spoke while accepting the nomination of his All Progressive Congress (APC) to fly the party’s flag as the presidential candidate in the 2019 elections. “The result of the presidential primaries of the All Progressives Congress this time is different because I am the only candidate. I thank all other eligible candidates who deferred to me in the interest of our party unity and over-all national stability,” Mr. Buhari. Mr. Buhari who expressed appreciation for the confidence reposed on him by party faithful accepted the party nomination, saying “Fellow party members, it is with a deep sense of humility that I stand before you today to accept the nomination of our party, the All Progressives Congress to be its candidate and flag-bearer in the 2019 presidential elections. “As I stand today before you, there is no honour greater than the confidence given to me by all of you when you affirmed my nomination. I thank you for your support. I thank you for your guidance. I thank you for staying committed to the CHANGE agenda. According to Mr. Buhari, the I accept this honour as a tribute and mark of confidence to carry the responsibility as we all join hands to continue the good work of the APC government to 2023 and beyond. “We are very proud of our record from 2015 to date: We have arrested and checked the slide to anarchy on the security and economic fronts. Boko Haram is reduced to dastardly attacks on soft targets. 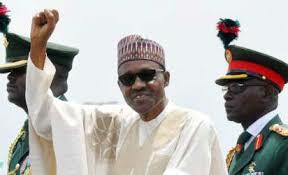 Normalcy has returned to much of North East and neighbouring North West states,” the president said. Adding that “our currency has stabilised. Our reserves are now $44 billion, a lot higher than we had in 2015. Power generation capacity has reached 8,000 megawatts against less than 4,600 when we came into office. As we invest in new power generation infrastructure we are strenuously working to address the legacy deficiencies and challenges of transmission and distribution networks across the country. “We are executing Independent Power Projects in 9 Federal Universities to deliver uninterrupted power supply and we intend to expand to a total of 37 Universities We have revived most of our capacity to produce fertilisers locally,” he added.